joshuaw81 提问: Hi Thomas, just started one of your cannon kits earlier today and it’s already turning gray. Already a fan of your work! 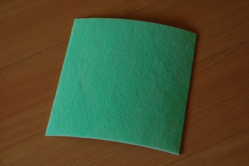 Two quick questions for you: 1- I received a foam/fiber square that is white on one side and light green on the other. I’m assuming this is packaging, and not part of the filter? 2- Are these HEPA filters washable? Many thanks! The pre-filter goes behind the HEPA filter, and it catches the larger dust particles so that the HEPA will last longer. We don’t include pre-filters on the Original DIY because the fan isn’t as strong as the Cannon. Can I wash the HEPA? Some manufacturers claim that their HEPAs are washable, but we actually tested it. We tested dirty HEPA filters, washed some, vacuumed some, and tested them again. Unfortunately the answer was no. HEPAs are not washable. That’s one reason we try to keep our HEPAs as affordable as possible.